CAMBRIDGE, Mass. - Feb. 1, 2019 - PRLog -- Revolutionary Snake Ensemble Mardi Gras Party with special guests Alonzo Demetrius & Brian Richburg Jr. Tuesday, March 5, 7:30 pm. Tickets: $22, students $17. Regattabar at the Charles Hotel, One Bennett Street, Cambridge, MA 02138. For information: 617-395-7757, regattabarjazz.com (http://www.regattabarjazz.com/); advance tix: www.getshowtix.com/regattabar/moreinfo.cgi?id=4074. Revolutionary Snake Ensemble (RSE) returns to Regattabar for the party that is a Boston Mardi Gras tradition. This year, the evening will feature two up and comers, drummer Brian Richburg Jr. and trumpeter Alonzo Demetrius, who are both destined for big things in the music world. Richburg and Demetrius have appeared individually with the likes of Nicholas Payton, Terence Blanchard, Donald Harrison, Jr, Ellis Marsalis, Tia Fuller, and many others. Both of these young players met as students at Berklee and currently collaborate in the experimental hip-hop group Alonzo Demetrius and The Ego. The band's music draws upon a diverse array of musical influences, blending the improvisation and spontaneity of jazz music with 808s and other electronic elements of contemporary music. RSE encourages everyone to keep Richburg's and Demetrius' names in mind, since their contributions to the Regattabar show will prove to be unforgettable! 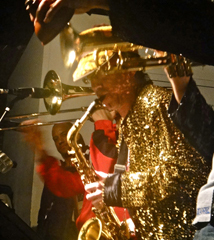 New Orleans' Offbeat Magazine says "New Orleans brass band meets Sun Ra and Ornette Coleman -- fiery yet booty-shaking music -- it's a stone cold killer diller! ... Most bands can't get the New Orleans stuff right, but the Revolutionary Snake Ensemble is one of the few who does and then takes it in fascinating directions." Seattle's KBCS adds that RSE "continues to mine the vein of New Orleans -- with post-bop, and touches of Avant -- this band cooks; edgy, raucous, fun, and first rate! ... kick start any party you're thinking about throwing." Drummer Brian Richburg Jr. was born and raised in New Orleans, and began playing in his father's church at an early age. While growing up, he was exposed to the diverse sounds and cultures that define the uniqueness of that city. Richburg's drumming incorporates the African and Caribbean inspired rhythms of the New Orleans street bands. He has appeared with Nicholas Payton, Donald Harrison Jr., Ellis Marsalis, Christian Scott, Delfeayo Marsalis, Amina Figarova, and many others. Richburg is an ASCAP Louis Prima Award winner. Trumpeter and composer Alonzo Demetrius is originally from Plainsboro, NJ. In high demand due to his versatility and technical precision, he has worked with an ever-growing list of notable and stylistically diverse musicians, including Terence Blanchard, Terri Lyne Carrington, Christian Scott, Bilal, Chris Turner, Jason Palmer, Sean Jones, and Tia Fuller.